Hydro-massage is a great way to relieve tension after a hard day at work. It has been proven that, muscle performance returns due to jets` pointing effect, therefore after fifteen minutes spent in the hydro-massage tub you will feel fresh and rested. Such an impact positively affects performance of our nervous system as well. If bathroom size allows you to install this type of bath tub, it is the right time to think about picking the suitable model. There is a great variety of different options for every taste and budget in specialized stores. corner – best suited for small bathrooms. 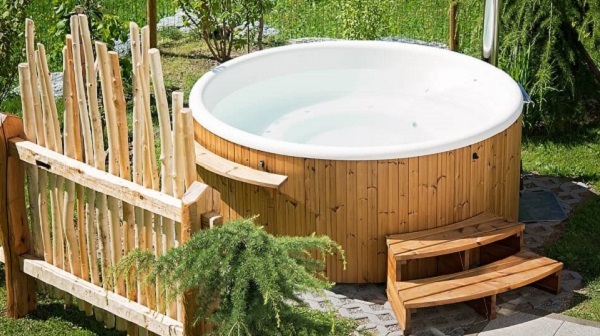 Corner-shaped hydro-massage tubs are also popular due to the fact that corner shape considers human anatomical features, hence it guarantees effective relaxation. round – less common that first two shapes, due to the fact that it is best suited for big-sized bathrooms. There are three common types of material used to make hydro-massage tubs. Steel holds the first place. It is relatively inexpensive, has low weight, and therefore creates no complications during installation. However, tub made from steel has couple of significant deficiencies like not retaining heat level very well (water in such tub will cool down very quickly) and high noise level while filling in the tub. Another type of material is cast iron covered with enamel. Cast iron is more expensive than steel and tubs made from this material weight a lot more – but you can always request delivery and installation, that way you won’t have to worry about it. However, you have to be extremely careful with an enamel coating; it is unlikely that you will be able to get rid of a chip on your own so that there are no signs of damage, therefore expert assistance is needed. The best option is acryl. Acrylic tubs are light in weight, retain heat level longer and scratches can easily be painted. It would be correct not to engage in self-assembly due to the fact that hydro-massage tub includes not only tub shape, but other components such as pump, nozzles, remote control and additional parts. In order not to waste your time, expert with relevant experience is needed. Call us at Miami Bathtubs to install bathtub of any shape quickly and easily. We will be waiting for you at any convenient time!